This meal is one of the most popular breakfast dishes in the world. There are millions of kids (and adults!) who ask their parents to make french toast early every morning. I mean, who doesn’t love a Sunday breakfast filled with warm, sweet french toast? I got this recipe only from the best; my mother. They are delicious, and I hope you think so too! 1. In a small bowl, mix syrup, milk, eggs and salt together. 2. Heat butter in frying pan. When the butter sizzles, quickly dip each piece of bread into the egg mixture, coating both sides. 3. Fry each slice in frying pan, turning bread once so that each side browns. January 9, 2012. Tags: bread, breakfast, delicious, egg, eggs, french, french toast, kid food, kids, kids breakfast, maple, maple syrup, mom's breakfast, popular breakfast, popular breakfast dish, recipe, sunday breakfast, sweet, sweet french toast, syrup, toast, warm, warm french toast, white bread. Breakfast. 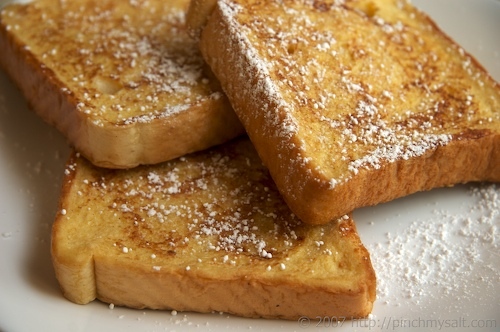 LOVE french toast! This morning (yep a Sunday morning…typical!) I had french brioche toast. I think I’ve totally coverted. Can’t do white bread anymore. Great recipe MostlyDesserts! Maple syrup to sweeten is much more flavoursome than sugar. May 6, 2012 at 5:09 am. Permalink. Haha I don’t really like french toast, but when I make this recipe, I can’t help myself so I take a piece. I think it’s mostly because of the, as you said, flavoursome syrup! May 6, 2012 at 4:33 pm. Permalink.